England came to Dublin to do a job and they did it well. It all started in bright sunshine and ended up in torrential rain. 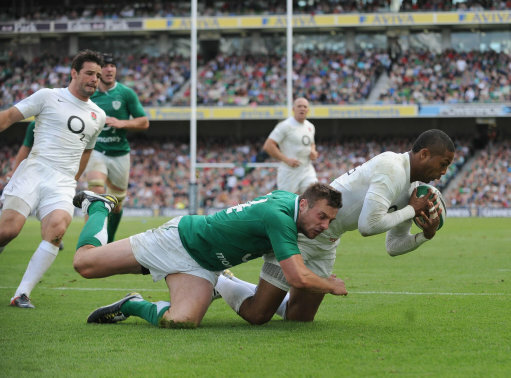 This week was a much better performance all round, tries being scored and reducing Ireland to only scoring penalties. England's first Try by Tuilagi came after just 6 mins into the match and Wilkinson converted without problems. The match then went with a selection of penalties O'Gara and Wilkinson again doing what comes natural to them both. England need to cut down on the penalties going into the Rugby World Cup, they can't keep giving these away so easily. Second Half starts with Chris Ashton being sent to the sin bin for 10mins (going off his feet at the ruck)..... Here we go again DISCIPLINE guys come let's have some please! England on the move again Tindall shoves a kick through and Armitage touches down for the second try. Conversion from Wilkinson from wide out left. Have to admit Wilko looking good today espec., kicking again. Ireland players falling all over the place and breathing very hard, they don't look particularly fit to me. On the other hand England, I have to admit look very comfortable and it is the first time in a while I feel happy with the overall game. Omens look good England's first win in Ireland since the World Cup-winning year of 2003 and more good Omens The All Blacks lost out to Australia in the Tri Nations earlier today. Could the All Blacks be once again feeling the pressure of the big occasion looming, I wonder? Overall England looked good today especially during difficult weather conditions and their defence held up no player crossed the line to score a try against them. Yep I am sure the England management will be happy with that one. Two men of the Match for me Manu Tuilagi and Mike Tindall, I thought they gelled really well. when the real games start! Much better from England today. The forwards were great in the loose and the backs did well. Tindall did really well today. I knew he would. Great vision for that second try. He should continue to work well with Tuilagi. Too many penalties but a great morale boost going into the World Cup. Ireland never got into the game. Their backs looked disorganised. Defensively, Keith Earls was awful at 13. He looked like he had never played in that position before. Earls will be disappointed with Tuilagis try. He shouldn't have let it happen. Such bad positioning for the tackle. Ireland have a lot of work to do before the World Cup. Ireland have a lot of work to do before the World Cup. I think we also have a lot of work to do before the World Cup. We are also going to need lots of luck. It just looked to me like two second rate teams slugging it out for most of the match, especially having watched the Aus v NZ match earlier.